The week is almost finished already! Anyone doing anything special this weekend? I might have a movie date with my daughter depending on how she is feeling. Today I have the tutorial for the Braided/Weaved Ombre design that I did recently with the Butterfly Wing Studs :D All of the polishes and products used can be found here. The step-by-step instructions are below. I hope you all like it! Allow glue to dry and then your finished! Apply a fast drying top and that's it! I hope that you all enjoyed the tutorial. 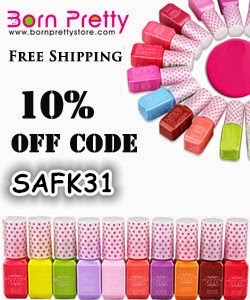 Don't forget to check out Born Pretty Store's nail art section for your nail art needs. You can use my code SAFK31 for 10% off of your purchase.